“Omaha the Cat Dancer” just paid for my lunch. 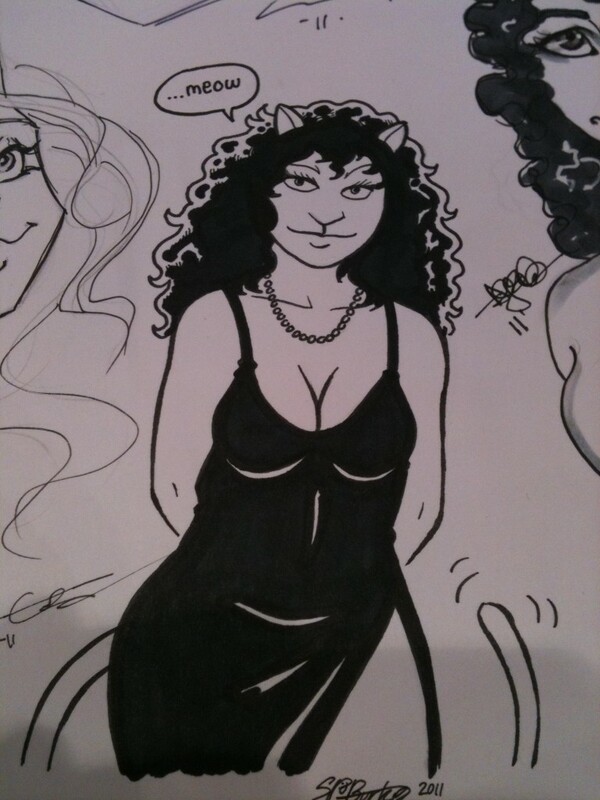 So our artist alley neighbors at C2E2 were doing a commission for a gentleman who was collecting sketches of “Omaha the Cat Dancer”, of which I am a huge fan. In fact my good friend and former professor Diana Green (who wrote the foreword of my first “Oh Goodie!” book) used to intern for “Omaha” co-creator Reed Waller. When the gentleman returned I enthusiastically offered to do one myself. Here’s what I did for him. Nice! You got the muzzle right, which is the part that often gave me fits. I saw her as a bit more, ahem, curvaceous than you have her. Very 50s/early 60s idealized figure! But still a fun piece! Why is dude collecting Omaha sketches? Just into it?